The country house first started appearing in paintings in France, with one of the very earliest depictions being that of the Duc de Berry’s houses and estates in 1416 by Pol de Limbourg. These paintings served not only as reminders of wealth but also as practical tools for the running of extensive estates. The earliest English contemporary of these paintings is a 15th-century portrait of John of Kentchurch with a view of Kentchurch Court, Herefordshire in the background. Although the depiction of the country house was a primarily European feature, it was still a relatively niche pursuit until the late 1500s, with painters more usually employed to portray the religious, historical or mythological. Detail of 'An Aerial View of Tottenham Park, Wiltshire' by Pieter Andreas Rysbrack (after 1737) - this picture hung for many years in the estate office. The trade in country house views was particularly popular in the Netherlands, where a demand for topographical engravings combined with many estates created a ready market. The genesis of the English tradition is also to be found here as the Royalist aristocracy fled to the region during the Civil War. The connections made at this time were to prove fruitful for the many painters who followed their current and prospective patrons back across the Channel after the the Restoration in 1660. Before then, views of a country house were usually part of an estate survey, bar a few exceptions such as those of Conway Castle in c.1600, Nonsuch Palace and Richmond Palace c.1620, and the ‘King’s houses’ by Alexander Kierincx in 1639-40. It was the famous engraver Wenceslas Hollar who completed the first significant set; five views of Albury House in Surrey in the late 1630s. Hollar was also significant in establishing the new fashion for these views once confidence was restored in the late 1650s. The Restoration of Charles II gave new life to the art, with Dutch artists eager to record the newly invigorated estates of the aristocracy. Without the artistic constraints often found in Europe, the style of the art in England was largely determined by the owner rather than royal preference. By the 1680s, the country house portrait was as well established, as well as those of the family, and reflected both pride and change. Views were often painted to record the old house before it was swept away or remodelled or after the work had finished to showcase their new seat. One of the finest artists of this period was Leonard Knyff who had arrived in England in around 1676 but whose first country house painting, completed in 1696, is of Dunham Massey, Cheshire. A few more paintings followed, but his master work was a collection of eighty engraved views published (by Johannes Kip) in 1707 under the title ‘Britannia Illustrata: Or Views of Several of the Queen’s Palaces, also of the Principal seats of the Nobility and Gentry of Great Britain…’. It remains one of the finest records of the country houses of the period – today, even individual prints can sell for hundreds of pounds and full copies of the book for tens of thousands. From the 1700s, the composition of the paintings shifts to include, and give greater prominence to, sporting activities and also the setting of the house, particularly the gardens. With sports such as riding and hunting being such a key part of the enjoyment and reputation of an estate, it was natural that these should feature in any artistic celebration. As the fashions for landscaping and elaborate gardens took hold, so to did a desire for these to also be included in such detail that the house became a much smaller element, subsumed into a wider bucolic vision. The more ‘survey’-like paintings showed in almost cartographic detail the layout of the gardens with the tree-lined rides radiating away from the house. This trend was not only driven by the owners who were very proud of their new environment but also because it was a natural continuation of the earlier work of these artists, as recorders of landscapes. John Harris argues that it would be difficult to confirm the exact influence which art exerted over landscaping but the popularity of landscape painters such as Claude Lorrain, coincided with the popularity of advocates of the more natural landscape such as Humphrey Repton and Lancelot ‘Capability’ Brown in the 1760s. Parkland now moved from the more formal ‘boxes’ which Knyff had so accurately portrayed, and was now shown as a more rural, naturalistic form, the landscape now dominating the picture. How far this style departed from formal country house portraiture can be seen in the works of J.M.W. Turner who frequently reduced the house to a mere smudge in the distance – and even when the house featured clearly, it was subordinate to the overall setting and atmosphere. That’s not to say that the ‘Claudian’ view was the only one – the preferences of the owners for clear visions of their seats kept artists such as William Hodges, James Barret, William Marlow, and Theodore de Bruyn busy too. By the mid-1800s there had been a marked decline in the demand for these type of paintings. Improved communications meant that houses were no longer so remote, and with the advent of mass printing, publishing filled the demand for images of the houses as typified by the eleven volumes of J.P. Neale’s ‘Views of the Seats of Noblemen and Gentlemen‘ (1818-1829). Owners of houses were also now increasingly from the new wealthy who had their powerbases in cities and the country house was merely a retreat. By 1880, photography was also firmly supplanting oil paint as the medium of choice, as shown by the success of photographers such as Bedford Lemere, and, by the 1900s, the success of magazines such as Country Life which placed a high priority on using only the best photos. However, in the last twenty years, a resurgent interest amongst country house owners has again created a demand for the country house portrait. Artists such as Algernon Newton, Julian Barrow, James Hart Dyke, Jonathan Warrender, and Marcus May have led the way in continuing the tradition. One artist has even been responsible for creating a country house which only existed in one of his paintings. Felix Kelly had painted an imaginary scene of Palladio’s Villa Rotunda within an English landscape; inspired by this, Sebastian de Ferranti then commissioned the architect Julian Bicknell to translate this art into reality, completing the house in 1986. These important paintings are now, for some houses, the only record of how they were before later changes obscured or obliterated them forever. For many others, they are a wonderful reminder of the beauties of architecture and are a unique and invaluable record of our country houses. The Challenge: can you identify the mystery house in this painting? 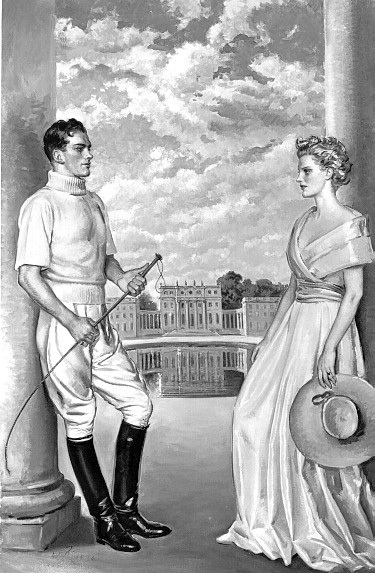 The catalyst for this post about country houses in paintings was an email I received from Wendy & Gordon Hawksley who are working to re-establish the reputation of William Bruce Ellis Ranken (1881-1941). A famous artist in his day, he socialised with the great and good and painted many of them before fading into obscurity after his death. This painting was exhibited at the Royal Academy in 1936 (this is also the year it was painted) under the title of ‘Portrait Group’ but as yet it has not been possible to identify either the sitters or the house. And so to the challenge: simply, can we identify the house – almost certainly English or Irish, Palladian, engaged columns to the front (a la Kedleston Hall) with flanking curved colonnaded wings facing a large reflecting pool. Obviously there may be some degree of artistic licence but it seems likely that this was the home of the subjects of the portrait. Suggestions either via the comments below or via email to me. No prizes I’m afraid beyond a credit here and the happy thought that art history is slightly richer for your efforts. For a more in-depth history and many images (and to which this post is much indebted) I recommend ‘The Artist and the Country House: from the Fifteenth Century to the Present Day‘ by the ever-brilliant John Harris – unfortunately now out of print. This entry was posted in News and tagged albury house, architecture, art, bedford lemere, claude lorrain, country house, country life magazine, english, estate, felix kelly, heritage, houses, humphry repton, j.m.w. turner, john harris, julian bicknell, kentchurch court, lancelot capability brown, parkland, surrey, tottenham park, westwood, william ranken, worcestershire. Bookmark the permalink. See……………..already an admirable chapter in what would be a valuable book. Aside from the reflective pool it looks remarkably like the North Front of Stowe (school), Buckinghamshire? A good post, as always. Hi – I was waiting to gauge the response to this challenge and if there was interest perhaps try a regular post, assuming there are more mystery houses for which I can get good quality images and permission. If you’d like me to post the ones you have then please do email them to me and I’ll see what I can do. The mystery house reminds me of a composite of various aspects of Hackwood Park in Hampshire, which has an oval reflecting pool and two wings. I was fortunate enough to tour the house in 1998 as part of Christie’s auction of its contents. Ironically, the owners of Kedleston Hall, Lord Curzon, rented Hackwood from the 1850s until 1935. Not a problem at all – a plug wrapped in a relevant fact is the best way to do it. I’ll put a tweet out about it too. Perhaps a pastiche? The columns the two people are resting against surely don’t actually exist in the context shown in the painting. On another note, can you post a picture the entire painting of Tottenham Park? I’d love to see it if it’s available. A more serious Hampshire contender for the mystery house’s central block is Moundsmere Manor, built in 1908 in the Hampton Court Palace style, which also had its contents auctioned by Christie’s in 2005, but doesn’t have a colonnade, with its 2 wings in a different location and size to the painting. Jennifer, I doubt it’s Russborough House because Russborough’s central block has two floors and a basement, whereas the mystery house has three floors and a basement. Christopher/MC, I doubt it’s Stowe because Stowe is far larger than the mystery house in all respects, and it’s unlikely that an artist would paint a house smaller than it really is, or is based upon (i.e. owner’s vanity). Can anyone suggest any other examples on country houses? Another smaller example of columns with statues on top is Sir John Soane’s Pitzhanger Manor in London. I would have to say Moundsmere Manor as the central block is very similar and also has a mirror pool although the pilaster capitals are different and obviously without the collonaded wings. Added to this W.B.E. Rankin lived nearby at Warbrook House, Eversley Hampshire and later at Farley Hill Place. It would appear that the central block bears a close resemblance to Moundsmere. My initial reaction (which I don’t think anyone has yet suggested) was that the house could be based on Castletown Cox, Co. Kilkenny. This house shares with the illustration a central block of three storys over basement and 7 bays, applied/engaged pilasters/columns to the central three bays, colannades linking symetrical wings, and a reflecting pool. I would tend to agree with other readers that this house represents, at the least, an idealised view, and perhaps a fantasy. In particular, those 3-story wings (of at least 5 bays) look unfamiliar.